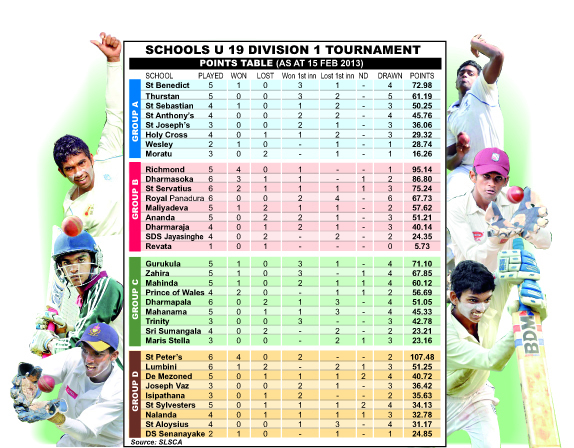 The Colombo dominance in school cricket is weaning. During the past two years it was Trinity College from Kandy, now the spotlight has turned towards the south of the island as Richmond Collage Galle, is turning tables. Last week the marauding Richmondites overran the Dehiwela Central XI with consummate ease to complete their seventh outright win for the season. The Richmondite juniors following their seniors’ footsteps and now look the side to beat even in the junior category. The juniors bagged the Under 13 Division One title (See Education Times) for the second successive year and this augurs well for them even for the future. Richmond outclassed the hapless Dehiwela Central by an innings and 40 runs and they had laid the foundation on day one when they bowled out their opponents for 150 and was in a strong position of 192 for 2. A scintillating batting performance on the second day by Sithara Gimhana who has been in top form further made things easy for them. Sithara who was unbeaten on 97 went on to slam an unbeaten 153 helping his side make a formidable score of 300 for 4 declared. Thereafter Saveen Nanayakkara, Thisara Bhanuka and Chamod Piyumal gave the finishing touches to bowl out Dehiwela Central for 110 and guide them to their seventh outright victory. So watch out for more from these Galle lads who are going great guns. The week ending also saw eight other outright wins being recorded with Trinity securing their second win when they defeated Sri Sumangala Panadura by 134 runs. St Joseph’s recorded their first outright win and it took them 12 matches to secure this when they beat Moratu MV by an innings and 55 runs. 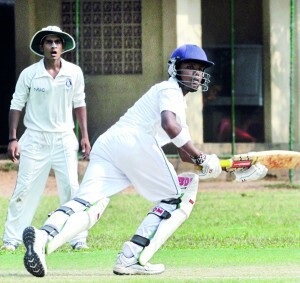 Thurstan inflicted the second defeat of Sri Sumangala whom they overcame by a massive 150 runs. Meanwhile Dharmasoka MV Ambalangoda who are celebrating their centenary coasted to the fifth win with a three wicket win over Maliyadeva while Mahinda recorded a six wicket win over Dharmapala Pannipitiya. The other three outright wins came in the lower division where Rahula Matara got the better of St Mary’s Matugama by an innings, St Anne’s Kurunegala defeating St Thomas Kotte by 34 runs and Kegalle MV overcoming Ibbagamuwa Central by ten wickets. Nalanda’s lackluster performances seem to be continuing as they had to face the agony of being bowled out for a meager 43 by D.S. Senanayake College which ended in a first inning win for the latter and prior to that they underwent a first inning loss to St Aloysius Galle too. Dehiwela Central following their defeat to Richmond came back in their next match against Lumbini MV when they dominated the proceedings of the match but had to be satisfied with a first inning win. Most of the other matches played during the week too ended in first inning wins for Ananda, Dharmaraja, Thurstan, Trinity, Joseph Vaz, Gurukula MV Kelaniya and Maris Stella in the top division. In the lower division St Sebastian’s Katuneriya secured two first inning wins first against fancied Kalutara MV and then against Sri Jayewardenepura MMV Kotte. The other teams to gain first inning wins in this division were St Thomas Matale who gained two, Bandaranayake MMV Gampaha, Veluwana MV and Rahula Matara. Looking back at the performances of the schools since the school cricket season went into full swing last month, the outstation schools have been the eye catchers with some fine individual efforts in both the batting and bowling departments. Nevertheless the main focus among the schools will no doubt be Richmond and they too will be looking forward to maintain their unbeaten record. But as the saying goes cricket is a funny game where anything could happen so we will have to watch and see how it progresses in the coming weeks.